Congratulations on your acceptance to Auburn University! 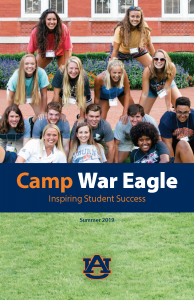 We look forward to hosting you at Camp War Eagle (CWE) this summer. Through CWE, we will provide an experience which will promote the academic, social and personal success of incoming freshmen students. 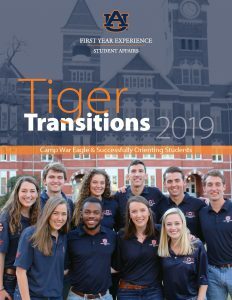 We hope our website will provide all necessary information and instructions to prepare you for your orientation session and your first year at Auburn University. Once you’ve submitted your confirmation deposit, be sure to check the orientation schedule and register for CWE. Registration opens in mid-March. Please do not make travel arrangements until you receive your online confirmation. We encourage you to explore our site and carefully read all emails and print material provided. If you need further assistance, please contact us.